LED ring R click is a mikroBUS™ add-on board with a ring of 32 red LEDs driven by four 74HC595 serial-in, parallel-out shift registers. 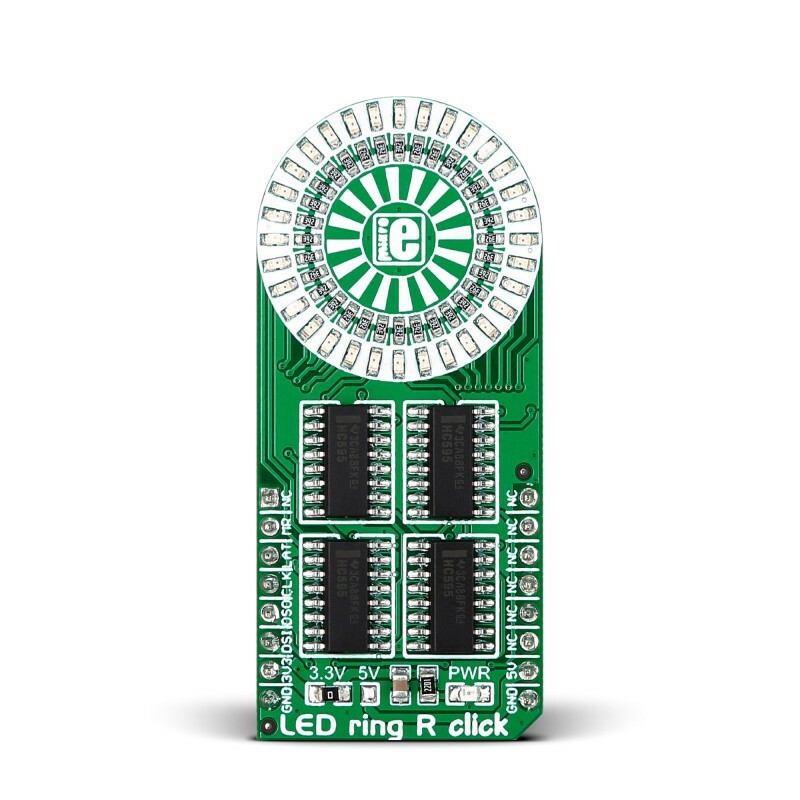 LED ring R click is a mikroBUS™ add-on board with a ring of 32 red LEDs driven by four 8-bit 74HC595 serial-in, parallel-out shift registers. The ring is 25mm in diameter. 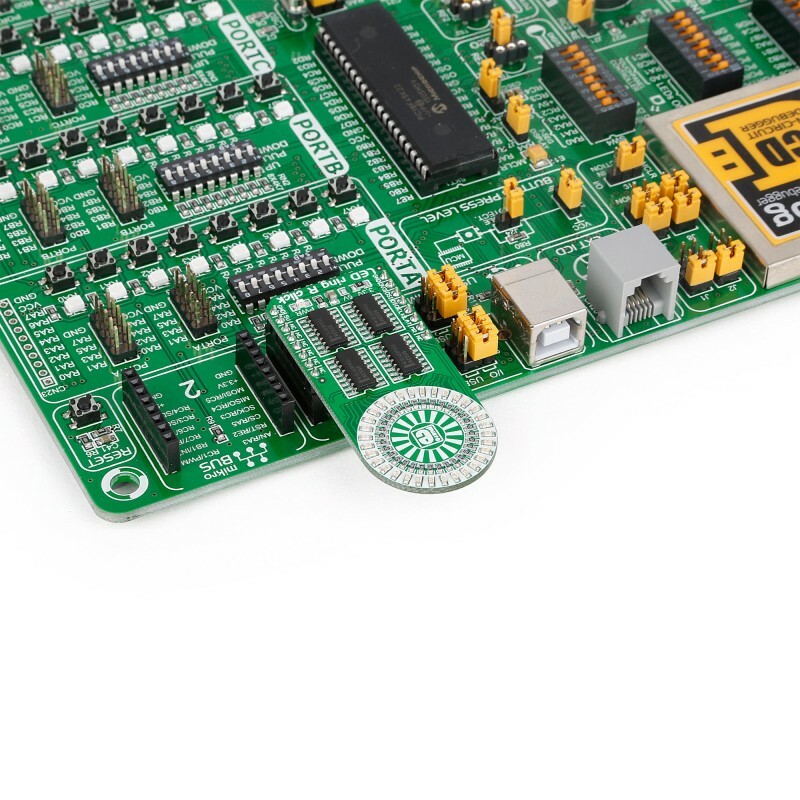 The click communicates with the target MCU through the mikroBUS™ SPI interface, with RST, CS, SCK, MISO and MOSI pins marked MR#, LAT, CLK, DSOUT, DSIN, respectively. Other LED colors will also be available. 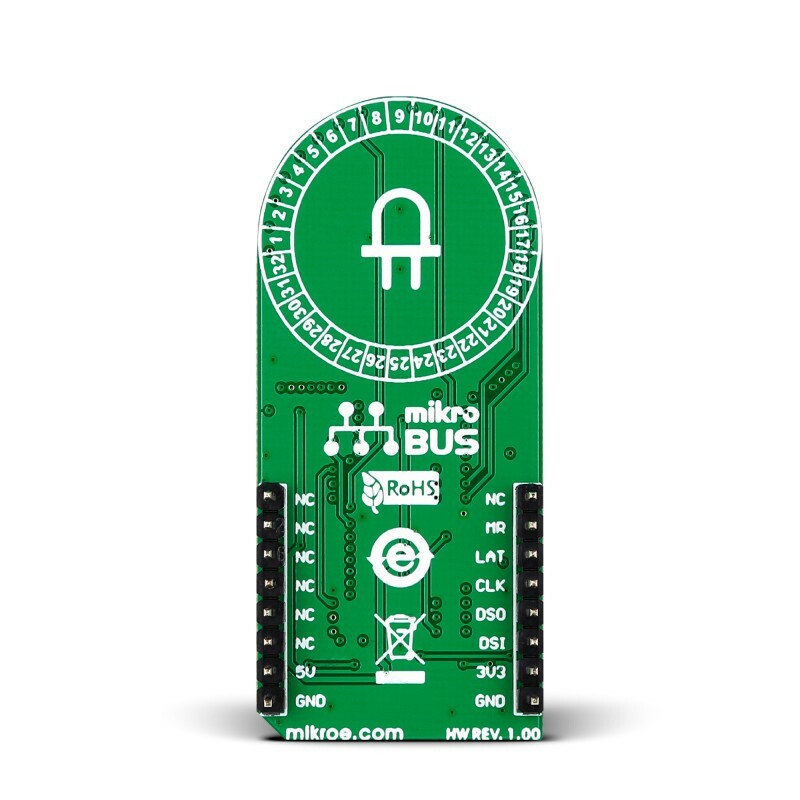 The board is designed to use either a 3.3V or 5V power supply only. LED ring click is one of several click boards that employ 74HCP595 shift registers to drive LEDs. Rotary click use the same, as well as Bargraph click, 7-Seg click and 7x10 click. Using 8-bit shift registers to drive an array of LEDs is simply good practice, because it leaves more available pins on the target MCU, allowing you to either use a cheaper, lower pin count main MCU, or use the leftover pins for other purposes. The end result is a smaller, more cost effective design. The following code snippet demonstrates different ways to communicate with the click and initializes a clockwork pattern with a single LED at a time. Code examples that demonstrate the usage of LED Ring click with MikroElektronika hardware, written for mikroC for ARM, PIC, and FT90x are available on Libstock.